Create a sophisticated presentation at your next catered event or special meal with this the Plexware Collection of plastic plates. A shiny and shimmery silver swirl border gives this heavyweight plate a distinct and charming style that combines the convenience of plastic with the elegant appeal of China. Plexware Collection 10 1/4" White w/ Silver Swirl Border Plastic Banquet Plates 10ct. Plexware Collection 9" White w/ Silver Swirl Border Plastic Dinner Plates 10ct. 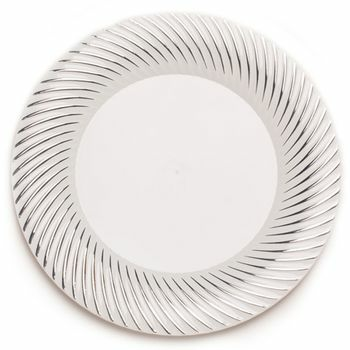 Plexware Collection 7.5" White w/ Silver Swirl Border Plastic Salad Plates, 10ct.